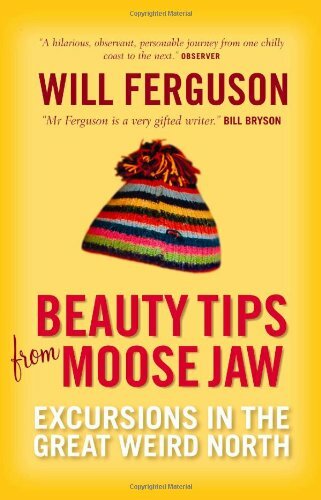 Beauty Tips from Moose Jaw: Excursions in the Great Weird North is a funny and extremely well written book detailing Ferguson's travels "in search of Canada" among the outposts and enclaves of the Great White North during the early 2000's. Whilst the trips take place in a non-contiguous fashion over a period of three-and-a-half years, the quality of writing ensures that each of his excursions melds seamlessly with the next, as he travels from the southern end of Vancouver Island in the west to the northern tip of Newfoundland in the east. Dipping into each chapter within the book provides access to wonderful insights into the history and people of each region he visits and collectively the book provides a patchwork explanation of what it is that makes the 10 provinces and 3 territories into the federal state of Canada. Serving up equal parts geography and history lessons, Beauty Tips from Moose Jaw is delivered against the personal backdrop of the author's own life while growing up in Canada. This memoir-like approach to parts of the book adds an additional positive dimension to the book. While sometimes referred to as Canada's Bill Bryson, Ferguson has his own unique voice and storytelling style that is extremely sharp, wry and engaging. Given the wonderfully scenic images invoked of the prairies, tundra and riverways through which Ferguson travels, one is almost forgiven for assuming that Ferguson is on the payroll of the Canadian Tourism Board. From the majesty of ye olde town of Victoria on Vancouver Island to the Polar Bear strewn tundras outside of Churchill, this is travel writing near its very best. Beauty Tips from Moose Jaw is a must read book for anyone interested in the early (European) history of Canada and who prefer it served up in an offbeat, fun and lively fashion. It is especially recommended for those with a love for Canada and who are interested in discovering some places off the usual snow trodden path.